The unemployment rate of a given economy is a key economic indicator of labor market performance. According to the Bureau of Labor Statistics, when workers are unemployed their households lose wages and the economy as a whole loses that individual’s contribution to the economy in terms of goods and services that they would have otherwise produced. Keeping the unemployment rate at a reasonably low level is key to creating a prosperous Louisville. Louisville currently ranks 9th among its peer cities in rates of unemployment with an unemployment rate of 4.9%. According to the Bureau of Labor Statistics, an individual is considered unemployed when they are actively searching for employment but are unable to find work. On this metric, Louisville sits in the middle of its peer group according to a natural breaks algorithm. Cities in green are those that outperform their peers, cities in yellow represent the middle cluster, and those in red are a group that lags behind its peers on this indicator. 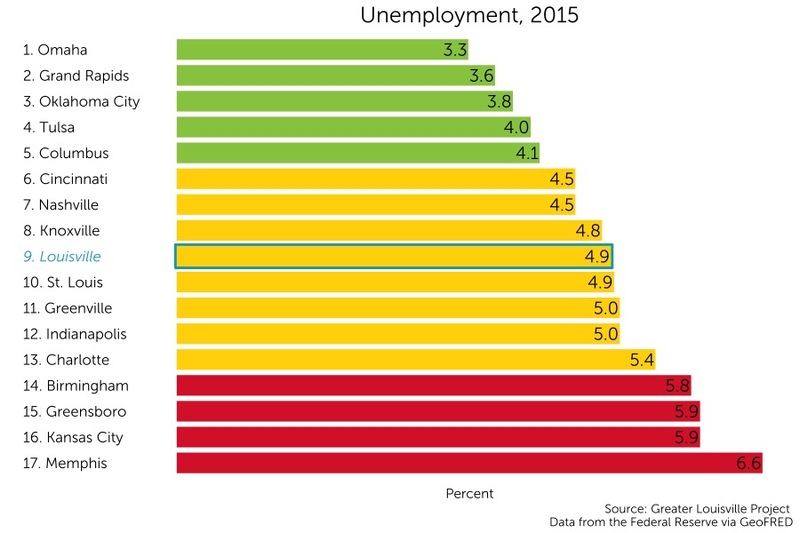 How does unemployment vary across Louisville? Although Louisville ranks 9th out of 17 cities in unemployment, there is tremendous variation across the city. In the map to the left, areas with lower levels of unemployment are displayed in white, and areas with higher levels of unemployment are displayed in purple. The lowest levels of unemployment of 4% are found in eastern Louisville in communities such as St. Matthews, the Highlands, and Floyd’s Fork. Communities with the highest level of unemployment include the Russell, Phoenix Hill, and Portland neighborhoods. The unemployment rate in Russell is 29%. Unemployment in Louisville has been steadily decreasing since it peaked in 2009 at 10%. 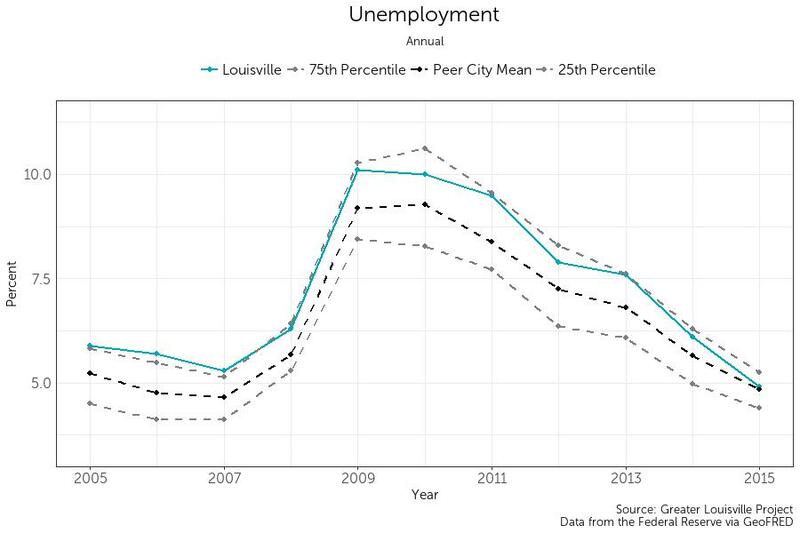 Since 2009, Louisville consistently had a rate of unemployment higher than its peer city average. However, Louisville has now returned to its pre-recession unemployment rate of about 5%. This rate of unemployment is now approximately equal to the peer city average.